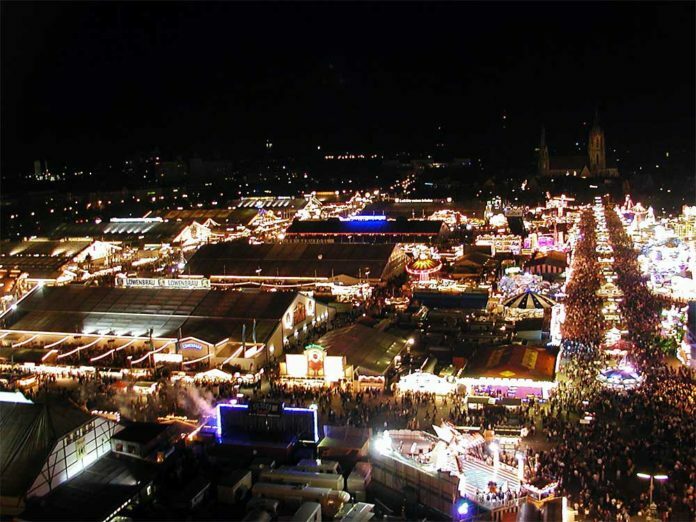 Munich’s Oktoberfest is the biggest and best beer festival in the world, and it’s also one of Germany’s most popular tourist attractions. 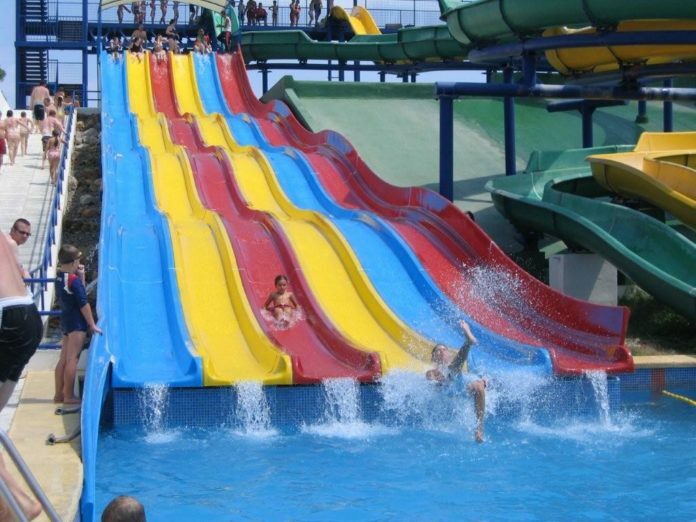 On average, the festival serves 7.3 million litres of beer — that’s enough to fill three Olympic-sized swimming pools! 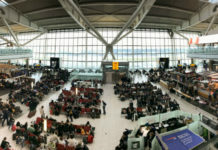 But with so much going on, it can be a bit daunting if you’ve never been before. 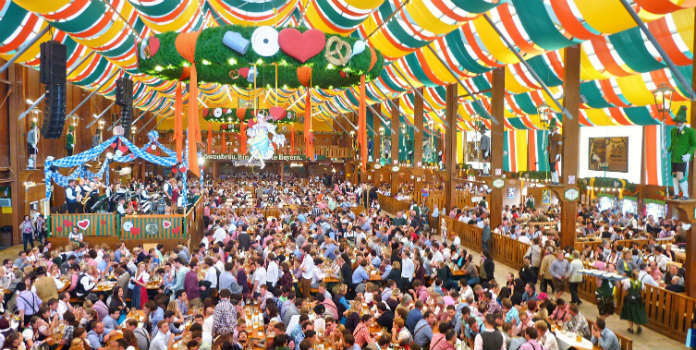 So we’ve put together this Ultimate Beginner’s Guide to Oktoberfest! And even if you’ve visited before, it’s always worth brushing up for the festival, which runs from September to October. Beer served at Oktoberfest has to be brewed within Munich, and it must conform to the Reinheitsgebot (or the “German Beer Purity Law”). The Reinheitsgebot is basically a series of regulations which dictate which ingredients can be used in beer. It’s based on a 1516 Bavarian law which stated the only ingredients permitted were water, barley and hops. Yeast was later added to the list as its existence became known. 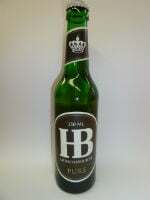 The revised Vorläufiges Biergesetz (Provisional Beer Law) of 1993 replaced the earlier regulations and is a slightly expanded version of the Reinheitsgebot. It stipulates that only water, malted barley, hops and yeast can be used for any bottom-fermented beer brewed in Germany. 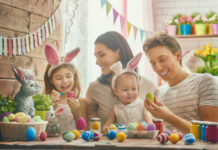 The law also allows the use of powdered or ground hops and hop extracts, as well as stabilization and fining agents such as PVPP. 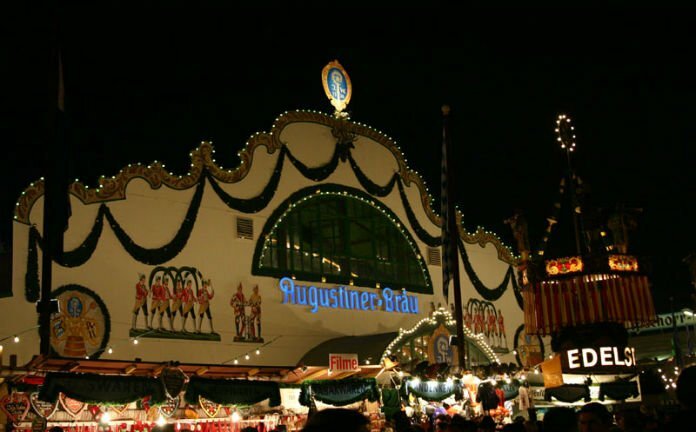 Augustiner was founded in 1328, with its most popular beer being Helles, a pale beer known for its long fermentation. Augustiner beers are available at the Fischer-Vroni and Augustiner-Bräu tents. The newest brewery at Oktoberfest, the Hacker and Pschorr breweries were previously established but only merged in 1972! 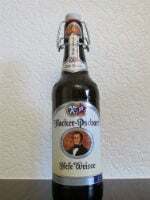 Back in 1810, what would go on to be Hacker-Pschorr created a beer for the wedding celebration of Prince Ludwig I of Bavaria and Therese of Saxe-Hildburghausen. 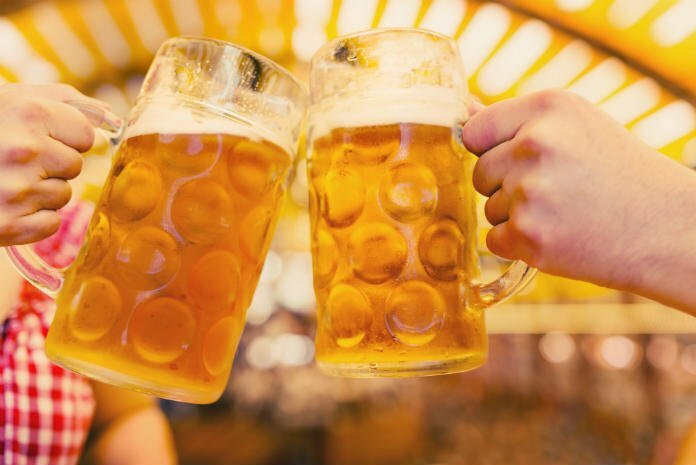 This single event marks the origin of Oktoberfest, and would go on to be celebrated each year! Hacker-Pschorr beers can be found in the Hacker and Bräursol tents. You can’t get much more Munich than Hofbräu as this Brewery is actually owned by the Bavarian state government. The reason is that it was founded as the Kingdom of Bavaria’s royal brewery, and many of the original beers are still made today. Watch out for their special lagers that can only be tried out at Oktoberfest. Hofbräu’s beers are available at — surprise surprise — the Hofbräu tent. 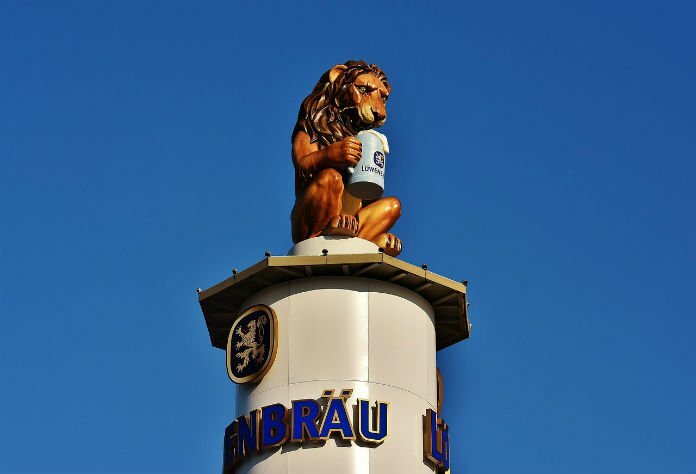 Löwenbräu means lion’s brew in German, and the brewery was established back in 1383. Their signature brew has the honour of featuring at every Oktoberfest since the first back in 1810. 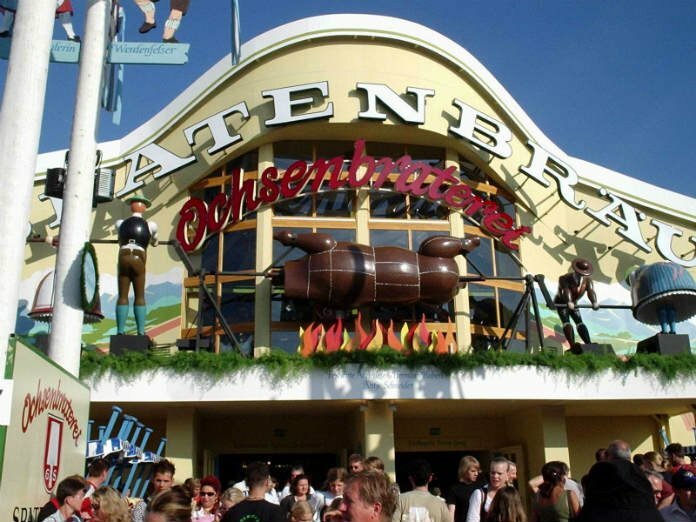 They also create an Oktoberfest exclusive beer for the festival, which can be enjoyed at the Schützen-Festzelt or Löwenbräu tent. 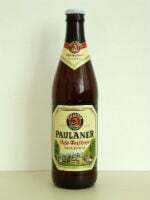 Since 1634 Paulaner was brewed by monks, and the name even refers to the order’s founder Francis of Paola. Paulaner was one of the first brewers at Oktoberfest and is one of the most successful breweries in all of Germany. You can purchase a Paulaner at Armbrustschützen, Käfer Wiesn Schänke and Winzerer Fähndl. The monk-fronted Spaten-Franziskaner brewery is known for its range of beers, including its pils and weissbier. Be sure to try the Oktoberfestbier which is available at the Marstall, Schottenhamel and Ochsenbraterei tents. So we’ve had a look at the beers, but what about the tents? Each one has a slightly different vibe to it, and it’s handy to know where to head depending on your mood. 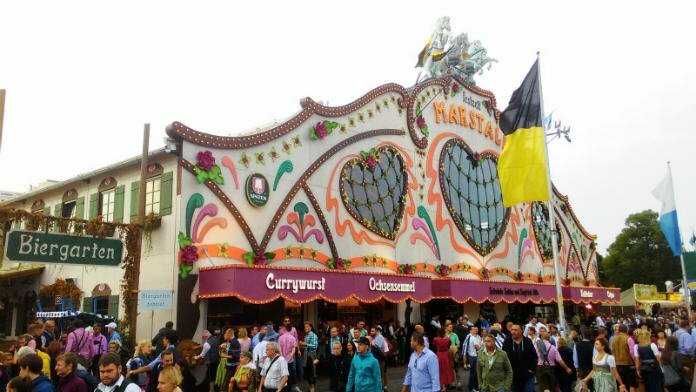 Armbrustschützen has been part of Oktoberfest since 1895 and boasts nearly 6,000 indoor seats and another 1,600 outside. It used to be known for being a fairly traditional tent and attracted a lot of the older locals, and this is still the case in the daytime when it’s quite chilled out. However, in the evenings Armbrustschützen has evolved into a bit of a party, and can get wild. The band belts out popular hits to get the crowd going and it can get a bit hectic in there at its peak! 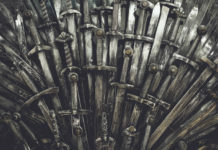 It gets its name from the German for crossbowman, and this is because Armbrustschützen is host to the annual German crossbow championships. Not to be missed! If you want an authentic experience, you go where the locals go, and Augustiner-Bräu is home to a lot of regulars. Perhaps it’s because the staff generally seem friendlier than other tents, or maybe it’s because the beer is served straight from the barrel — the only tent that does at Oktoberfest. 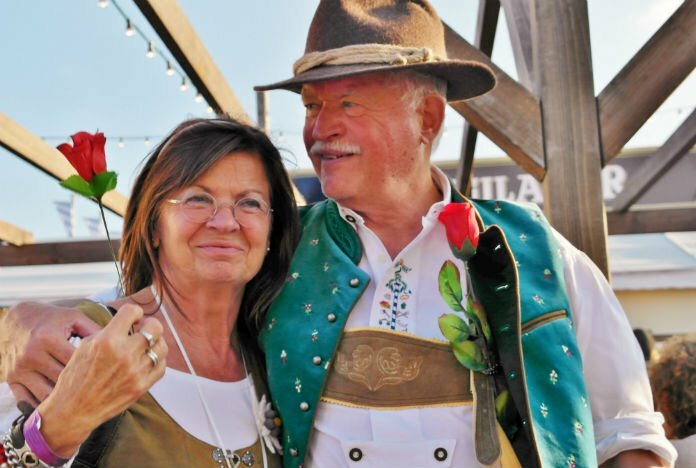 If you’re visiting with family, you’re advised to head here on Wiesn Tuesdays, which has reduced prices on food, all prepared by the Vollmer family using local meats and produce. It’s easy to spot the Bräurosl tent from its 20m maypoles at the front! Run by the Heide family, this beer tent is huge on tradition, complete with yodelers and Bavarian bands to keep the atmosphere fun. The venue’s alternative name Pschorrbräu-Festhalle comes from the daughter of the brewery owner Pschorr, as they say her beauty used to draw crowds from miles around. It also holds the honour of hosting Gay Sunday on the first Sunday of Oktoberfest, where the gay community celebrates and drinks with friends. 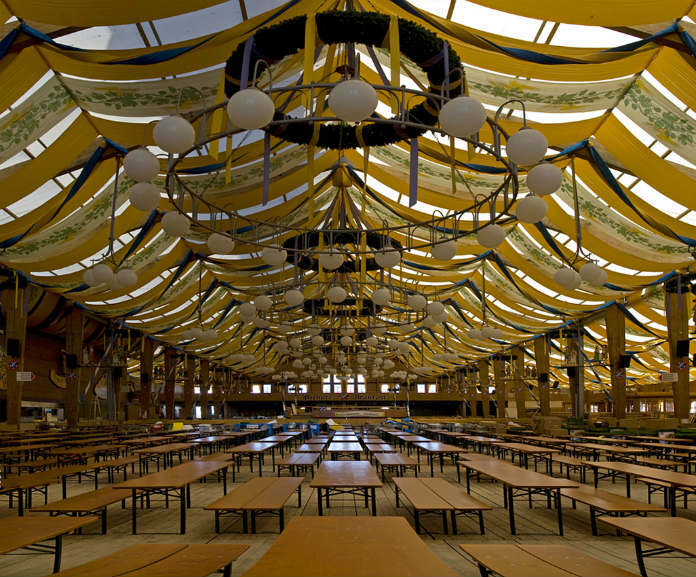 Of the 14 main tents at Oktoberfest, Fischer-Vroni is the smallest — but with more than 3,000 seats it’s not exactly lacking space. 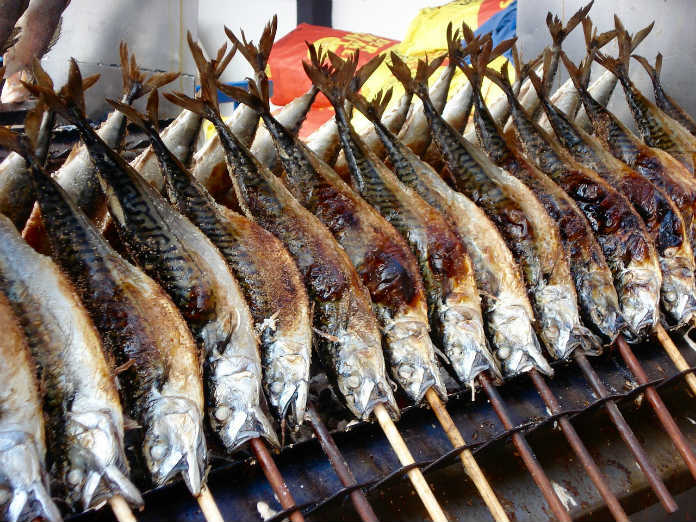 If you’re sick of the traditional German sausage and other red meats, you can grab a Steckerlfisch here, which is a grilled spit fish. 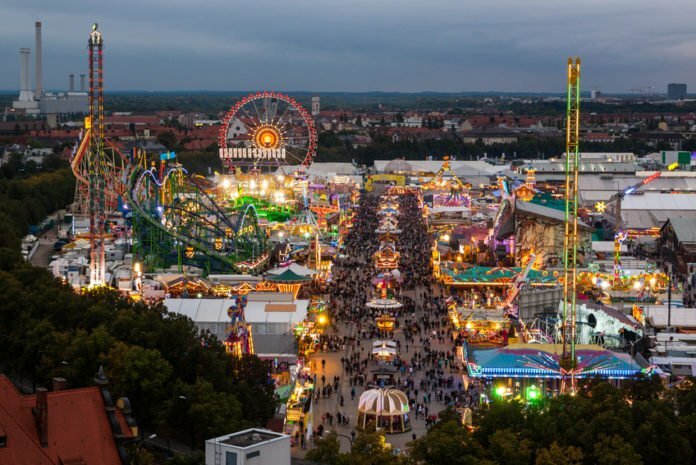 The relaxed and cosy atmosphere makes it the perfect location to get away from the hustle and bustle, and on the second Monday of the festival you can enjoy the Rosa Wiesn, where the LGBTQ community takes over for a day. 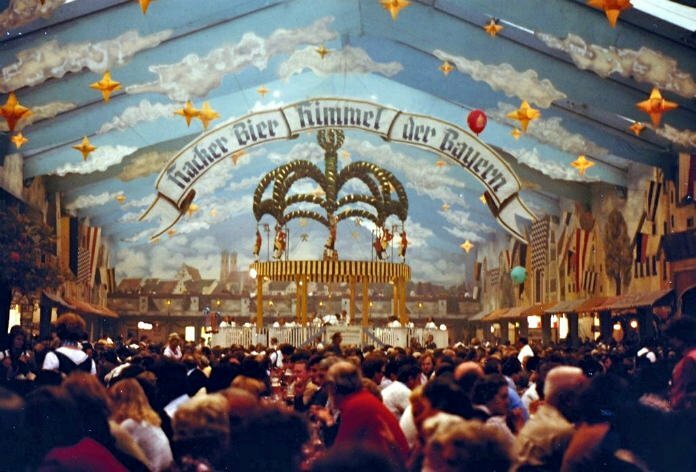 Hacker’s tent was designed by Rolf Zehetbauer (the German Art Director who won an Oscar for Cabaret), and due to its murals which show historical events and sweeping landscapes is known as Himmel der Bayern (The Heaven of the Bavarians). To match the mountainous wall art is a convertible roof which transforms the place into an open-air beer tent, allowing drinkers to enjoy the sun and scenery. The official Oktoberfest band Die Kirchdorfer have been playing at the Hacker-Tent since 1994, and you can boogie away on the revolving dancefloor from midday until closing at 10.30pm. The Hofbräu Tent is where you go for the biggest party in town. The tent itself is 7,000m² and holds 10,000 seats, so it’s undoubtedly the biggest, and nearly 800,000 litres of beer is consumed. This tent is a favourite for English-speaking travellers from the UK, USA and Australia, so if you’re struggling to connect with other Oktoberfest visitors, you might have a better chance here. Plus, the BBQ is to die for! 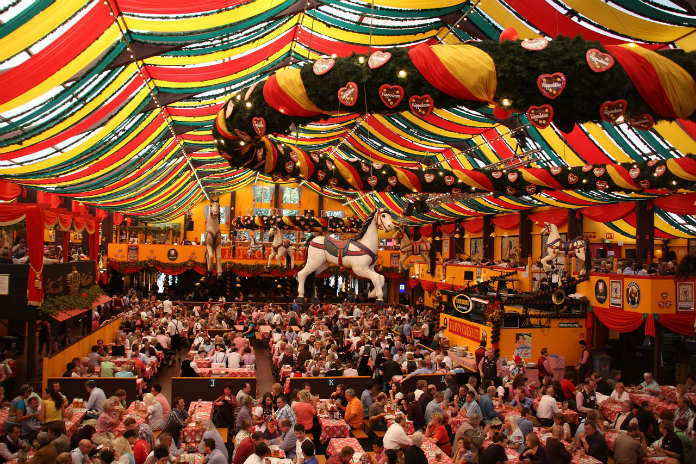 Although Oktoberfest is extremely busy, the tents are so large that it’s rare to not find a seat. Until you get to Käfer Wiesn Schänke that is. This log cabin is hugely popular with the rich and famous, including Boris Becker and the Bayern Munich football team, so unless you’re handy with a ball you might not stand a chance. Much easier to get into is the nearly 2,000-strong beer garden, where you’re still free to enjoy the (rather pricey) gourmet food such as roast duck. 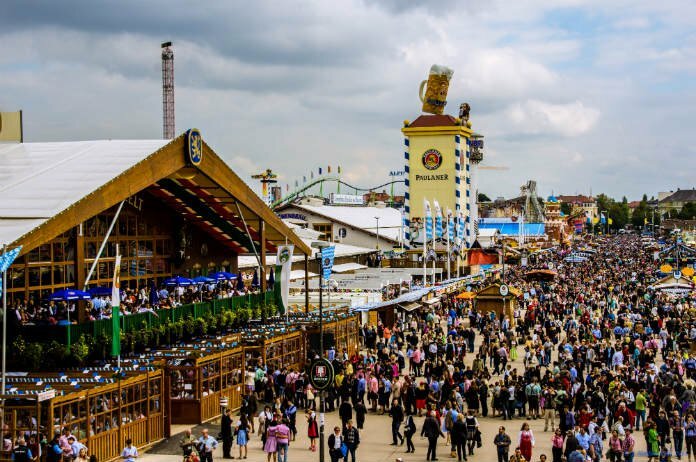 As a bonus, Käfer Wiesn Schänke is open until 12.30am rather than 10.30pm, so it’s where many people retire for a wine or Champagne after hours. The awesome live music in the Löwenbräu Tent makes it the best place to have a dance in the whole festival. A 148-foot lion statue at the entrance means you can’t miss it, and when you get in, it’s beautifully lit by 16,000 light bulbs! And ladies, in particular, can enjoy the Löwenbräu Tent’s Ladies Wiesn, which makes it a hotspot for influential female celebs. Opened just four years ago, Marstall is by far the newest beer tent at Oktoberfest, but that doesn’t mean it’s one you can skip. It’s generally associated with more civilised behaviour than the other tents at the festival — that means no dancing on benches (until late evening at least)! 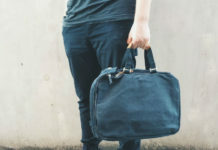 Its status as the new kid on the block means it does things differently, including vegetarian, vegan and gluten-free food options, something you’ll struggle to find elsewhere. In contrast to Marstall, meat is the main event at Ochsenbraterei, which mean ox rotisserie. This tent’s tradition dates back to 1881 when an ox was grilled in its entirety on a specially designed rotisserie, and the crowd went wild for the taste. Set up of this beer tent is quite the job, which takes 10 weeks to put up and another five to strip down. This is the tent you think of when you imagine Oktoberfest. Twelve gunshots are then fired on the stairway of Ruhmeshalle so that the other tents know they can begin service. At 151 years old, Schottenhamel is Oktoberfest’s oldest beer tent, but that doesn’t mean it’s just old timers — it’s full of young, boisterous students which has earned it the nickname The Tent of Youth. There’s a slightly higher chance of seeing a scrap here so you may be better relocating if you’re of a nervous disposition, but otherwise it’s a brilliant tent to visit. 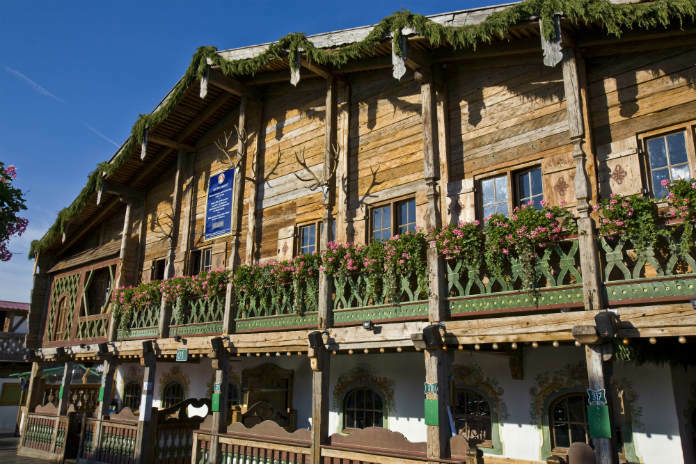 Schützen-Festzelt is the best of both worlds — it’s lively but respectful. We’d particularly recommend grabbing a bite to eat here before the night goes awry. You should definitely try the suckling pig with malt beer sauce — it’s delish. Schützen-Festzelt is a great tent to visit with family, as it’s located off the main ‘Bierstraße’ (Beer Street), so it’s a little quieter, but does start to fill up in the evening due to the house band Die Niederalmer who crank out all the rock and pop hits you could want! If you’ve somehow ended up at Oktoberfest and don’t even like beer, the festival has you covered. 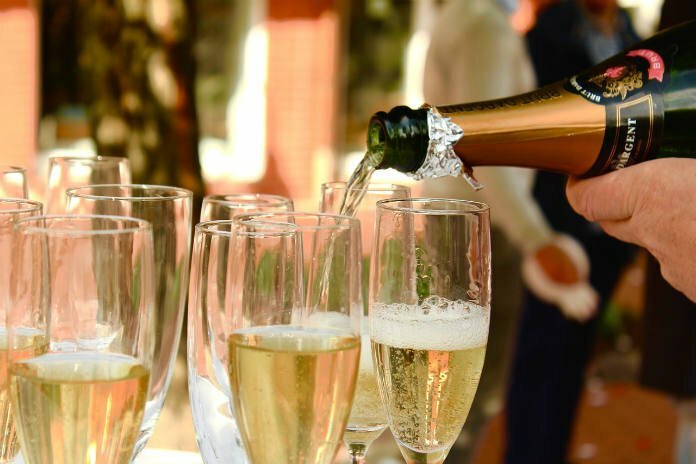 Wine and Champagne are served here, so you can drink to your heart’s content without fear of being judged by your beer swilling friends. This smaller, but lovingly decorated, tent is open until 1am, so you’ll find many popping in for a nightcap in the wee hours. You’ll notice this tent from the massive rotating Paulaner beer stein statue. It’s one of the cosier tents, which really adds to the atmosphere of the place, and reports each year say it’s a great place for celeb spotting. If the weather continues as it has this summer, the south-facing beer garden is one of the best places to be in the whole festival! 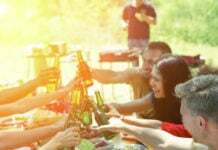 So now you’re acquainted with the beers and the tents, it’s time to run through how you can get the most out of the festival! 1) Line Your Stomach & Don’t Pre-Drink! As we’ve gone over before, the beer at Oktoberfest is strong, and you don’t want to show yourself up before you’ve even made it through a tent door! And on that note, it’s always good to go in on a full stomach so you’re not on the floor by 8pm. Whether it’s a hearty meal beforehand or a pretzel, make sure you’re not going hungry. Be prepared to pay almost double for food once you get inside a tent though! 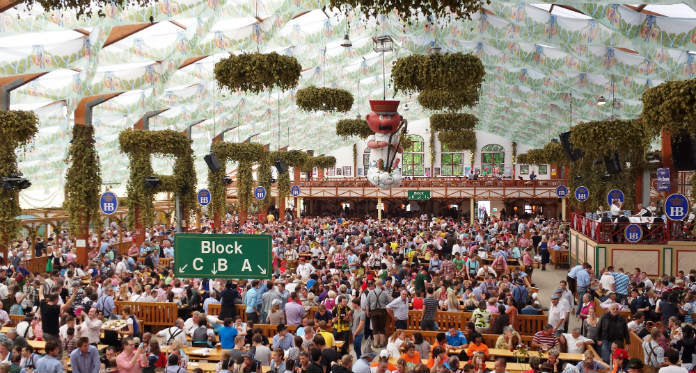 The phone signal within the confines of Oktoberfest is notoriously slow, so it’s wise to pick a meeting place and time. 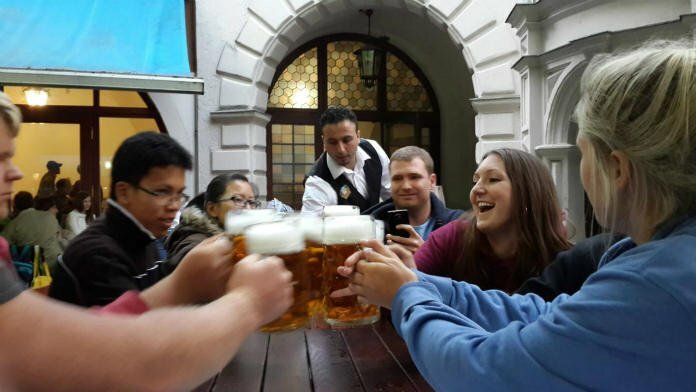 It’s pretty easy to get swept away amongst the crowds, especially with a couple of steins in you. So pick a certain point outside of one of the tents and establish this is where you’ll be before the night carries on. 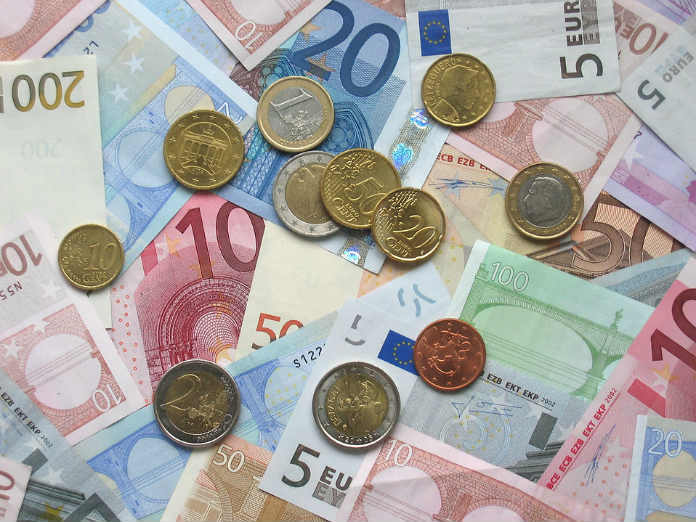 Tipping is always tricky in a foreign country, but it’s not too difficult at Oktoberfest. 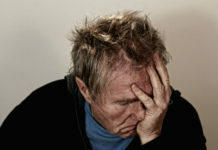 Give your server €1 per beer, but if they’re really attentive and help you enjoy your night, spring for a little more. For instance if you’re paying €11.50 for a stein (likely to be the average price this year), throw in €13 to round it out. €13 might seem steep for a single drink, but your drink will be more than two pints of high-quality beer, brewed right in the heart of Munich. Except in the Hofbräu tent, you’ll have to be sat comfortably at a bench before a server will come over to take your order. This keeps everything a lot more mangable and stops the festival form devolving too much into chaos. That’s why it’s important to get in early, and have a few members of your group scouting for space. And also why it’s sometimes unwise to vacate a tent when you’ve got a good spot. 5) Wear Bavarian Gear…But No Open Toed Shoes! Oktoberfest is a place you can really get into the local spirit. The majority of people will be dressed up in traditional Bavarian clothing, and you should be too! Men should sport some fetching lederhosen, knee-length socks and a felt hat, while women should sport a dirndl and apron combo. However, something that’s key with everyone jumping around in the tents is that boots should be worn to protect your toes from getting trodden on!